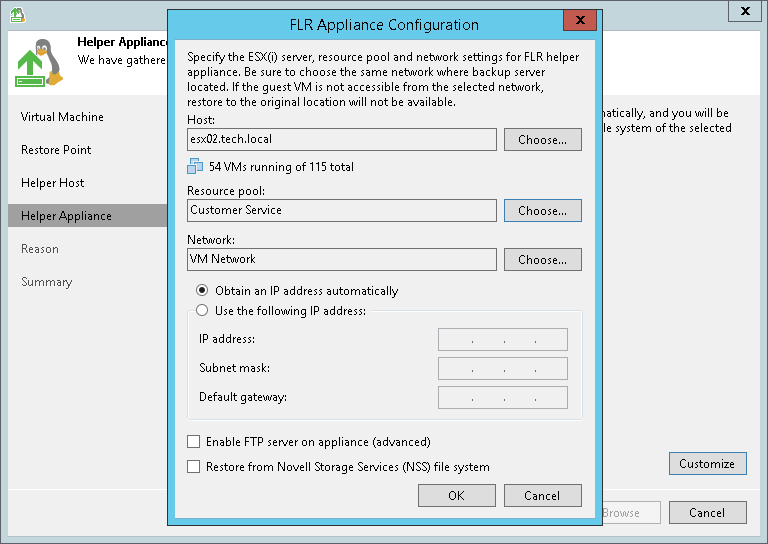 At the Helper Appliance step of the wizard, select an ESX(i) host on which you want to place the helper appliance. In the Host field, specify an ESX(i) host on which the helper appliance must be registered. In the Resource pool field, specify a resource pool to which the helper appliance must be placed. On the right of the Network field, click Choose. In the Select Network window, Veeam Backup & Replication will display a list of networks to which the specified host is connected. From the Networks list, select a network to which the helper appliance must be connected and click OK. Mind that the backup server and the mount server must have access to the helper appliance over the network. If you use a DHCP server in the network, leave the Obtain an IP address automatically option selected. To manually assign the specific IP address to the helper appliance, select the Use the following IP address option and specify the IP address, subnet mask and default gateway address. To enable FTP access to the restored file system, select the Enable FTP server on appliance (advanced) check box. As a result, users will be able to access the helper appliance over FTP, browse the file system of the restored VM and download necessary files on their own. If you are performing restore of a VM with the Novell Storage Services file system, select the Restore Novell Storage Services file system check box. Veeam Backup & Replication will deploy a specific appliance that supports the Novell Storage Services file system. When choosing an ESX(i) host for the helper appliance used for file-level restore from the Novell Storage Services file system, make sure that it allows running VMs with 64-bit guest OSes.